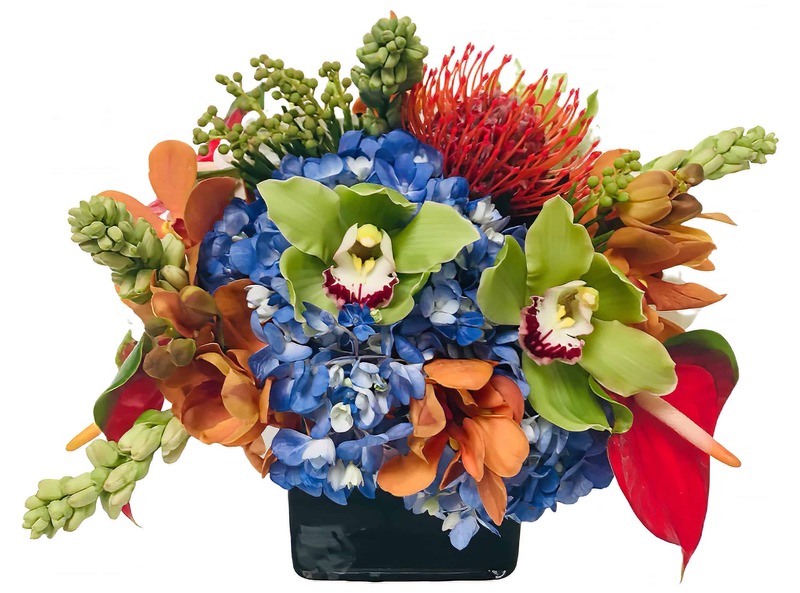 An Exotic mix of tropical flowers including bromeliads, miniature pineapples, blue hydrangea, orchids, horsetail, mini anthurium, tuberose and more. It's a pleasant mix of primary colors and sure to be a conversation piece. The Blue Hawaiian is a tropical vacation in a vase. You can taste the pineapple and smell the ocean breeze when you take it in. It's a great arrangement for any party as it breathes hospitality and is sure to be welcomed by guests or hosts! It can also celebrate a raise, an anniversary or a new home with its lively colors!